The information about this bug in Launchpad is automatically pulled daily from the remote bug. This information was last pulled on 2018-12-13. The names for the root partition in Nautilus' Places panel and main panel (Computer view) differ. Not sure this is gvfs related, though. Thank you for taking the time to report this bug. I think that it is more likely a nautilus problem, so I am setting the package to nautilus. I can confirm that this bug also exists in Hardy. Since there is enough information here, I am marking this bug as Triaged so that a developer can have a look at it and begin work. I think bug 53619 is worth mentioning here, as it complains that "filesystem" is a poor name choice for the root partition. You misspelled "consistent" in the summary. We want to settle on a single name for this, and it may not be "Filesystem" or "File System". Will you also accept a patch to attach the "distributor-logo" (ubuntu icon) to the filesystem folder? currently the icon is missing in computer:/// since I couldn't find it where's in the code, can you help? If you decide not to call it "File System"/"Filesystem" you may want to change it in the filebrowser (or file browser ;)) plugin in Gedit too (plugins/filebrowser/gedit-file-bookmarks-store.c, end of function init_special_directories). Well, someone needs to make the decision about what to name it, but here's a patch to change gvfs to "File System" if that's the decision. 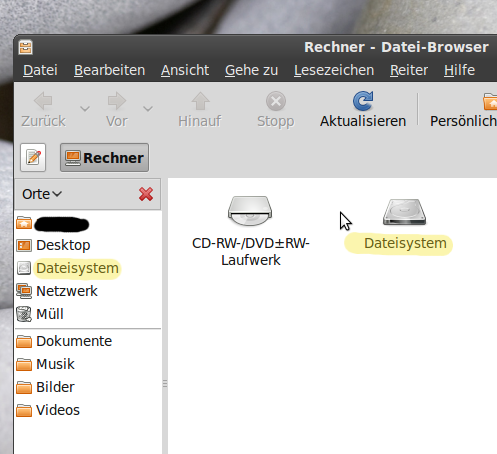 In my german Ubuntu I have 1 translation. "Filesystem" and "File System" are used interchangeably from what the dictionary tells me. I think we all realize that both are pretty bad names, but for the sake of consistency, let's agree on Bryce's suggestion go with "File System" across the board. We should open another bug to suggest a better name. > another bug to suggest a better name. > Bryce, is this ok? so, new users will know that everything related to the system is Linux. The Kernel, the files, everything is the filesystem... so, everything is Linux. We, the geeks, know that linux if more than a cople of files, but introduce the Linux concept to new users is really hard. They first need to know about kernel, aboud desktop, about distribution and lot of things!!. So, peter, a new linux user will see 'Linux' click it and see a lot of files related to the system. So, from today, peter will know that linux is his system. He already knows that his good frien dael has installed on his PC a copy of Ubuntu, so he knows he runs Ubuntu, but from today he will know that his Ubuntu has something related to the system called Linux. Discussed and disputed upstream, and we will not do such string changes at the distro level. Reassigning ti match the upstream product.